The present study was carried out to elucidate the response mechanisms of 50-year-old Pinus halepensis Mill. trees to a long-term and severe drought. The amount of water available to trees was artificially restricted for 12 months by covering the soil with a plastic roof. Over the short term a direct and rapid impact of drought was evident on the water relations and gas exchanges of trees: as the soil dried out in the Spring, there was a concurrent decrease of predawn water potential; transpiration was strongly reduced by stomatal closure. Seasonal changes in the water volume fractions of twig and stem xylem were observed and interpreted as the result of cavitation and refilling in the xylem. When droughted trees recovered to a more favourable water status, refilling of embolized xylem was observed; twig predawn water potentials were still negative in the period when the embolism was reversed in the twig xylem. A few months after the removal of the covering, no differences in whole plant hydraulic resistance were observed between droughted and control trees. 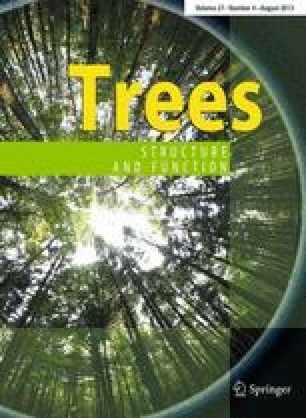 Needle and shoot elongation and stem radial growth were considerably reduced in droughted trees; no strategy of trees to allocate carbon preferentially to the stem conducting tissues was apparent throughout the experiment. An after-effect of the drought on growth was observed.